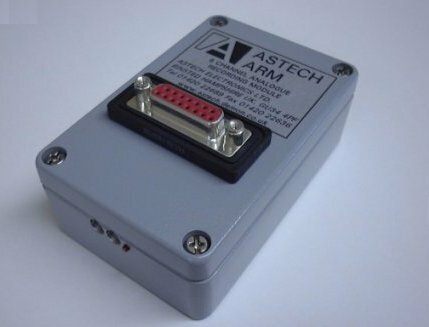 The Astech ARM (Analogue Recording Module) is a compact, self contained, solid state recorder for collection of single and multi channel sensor data. Sample rates may be set over a wide range, from 1 every 3 minutes to 10,000 per second, making the ARM suitable for both logging and dynamic data capture applications. In order to make the ARM adaptable to a wide range of sensors/transducers, the input conditioning circuit board is in the form of a plug-in component, available in 4 or 8 channel versions according to the transducer type. For special requirements Astech will build a custom design board to suit a particular type or combination of sensors at nominal cost. A high speed bi-directional infra-red link is used for communication between the ARM and laptop/PC, eliminating cabling and the need to make any physical connection. Valid operation of the link is indicated by LEDs on the infra-red transceiver interface unit and the ARM. ■ An understanding of how electronic systems can be made to survive extreme levels of temperature, vibration and centrifugal loads. 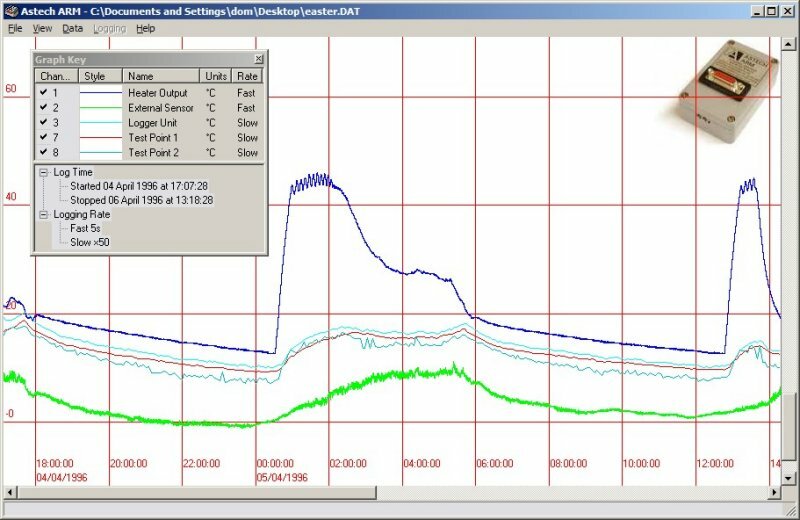 Setup data defining the ARM operating mode is input via an easy to use graphical user interface, available for PC in Windows XP. 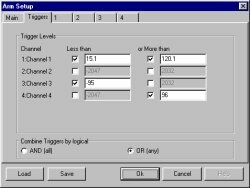 Select each input channel as Fast or Slow, select the sample rate for the fast channels, and select the relative rate for the slow channels. The software displays the maximum length log to fill the ARM memory. The Start Mode sets how the log will be started. 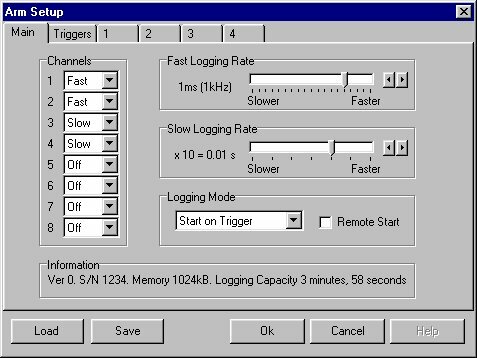 Triggered Start Setup - the log will begin when input channels exceed the user set limits. 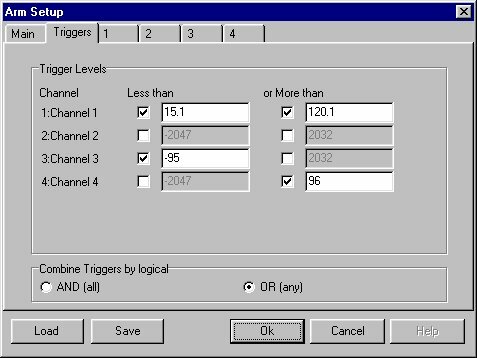 Multiple channel triggers can be combined with a logical OR (so that any single channel can start the log) or a logical AND (so that all specified channels must trigger simultaneously to begin the log). The start mode can also be set to Delayed - to start a specified time after the start command is sent, or Rolling - where memory is filled repeatedly until the log is stopped. 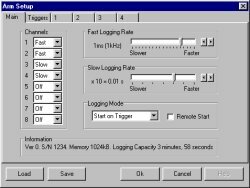 If the log is started from the PC and not the handheld unit, then the time delay mode can be used to start the log at a specified date and time. Once the ARM memory is full or a stop command is received, its operating mode switches to standby to maximise battery life and the memory contents are stored until overwritten by a new record operation. Subsequent downloading of data into a laptop or PC is carried out by pointing the infra-red transceiver unit at the ARM and selecting the software download command. Downloading the 262,000 measurements from ARM memory to disc takes 55 seconds. To simplify attachment of the ARM, an optional steel banding/mounting plate assembly is available. This may be used to attach the diecast enclosure version of the ARM to, for example, structural components, rotating shafts and rig frames. Illustrated is a custom design ARM for the measurement of strain and temperature on a conveyor belt whilst passing through a refrigerated section at -60°C. Internal heaters ensure that the battery is maintained within its working temperature range. Please contact Astech Electronics to discuss specific applications. Astech Electronics Ltd was established in 1973 for the design and manufacture of rotary and short-range non-contact telemetry systems. Astech are located in their own premises in a pleasant rural position about 50 miles southwest of London.